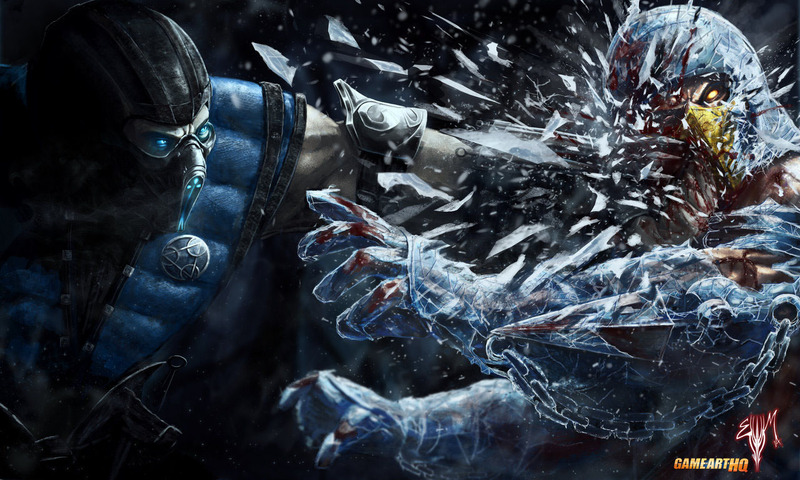 Sub Zero in Mortal Kombat X – Breaking the Ice – Breaking Scorpion’s Face! Finally Sub Zero gets a bit spotlight since the first Mortal Kombat X Trailer was revealed a few weeks ago and Scorpion just killed Sub Zero as usual. And just a kouple of days ago, Netherrealm Studios released pretty nice wallpaper artworks of the new kharacters like Kotal Kahn and D’Vorah and also new Scorpion Artwork to illustrate the visible battle damage in details, but Sub Zero got nothing! “I thought I would join the party of MKX related fan art. I had this idea in my head to paint but was going to wait. Then all the hype surrounding the new MK happened and I couldn’t help my self. Originally I was gonna do it with MK9 costumes but I wanted to get everyone’s blood pumping with the new designs. Usually an image like this would frustrate me but it practically drew itself. The biggest trouble spot was Sub-Zero’s medallion, stupid thing. Other than that It was total fun to work on.